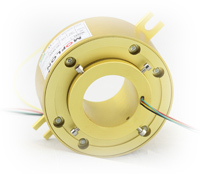 High speed slip rings are used in applications up to 20,000 rpm. innovative fiber brush contacts provide long-life and operation up to 10,000 rpm without the need for cooling equipment. MOFLON specialize in customized solutions, until now, our model have over 12000, and over 80% model customized with customer request and base on technology and full experience, our slip ring solution including traditionary carbon brush, gold wire contact, gold fiber brush contact, no contact transmit, each solution application depend on the customer real application request with economically, high quality and reliability.